Do you like Poly and the Marble Maze? Share it with your friends. 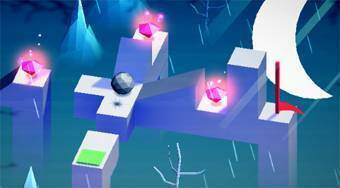 Poly and the Marble Maze is a splendidly crafted jumping game in which you have a total of sixty different levels of difficulty divided into three game worlds. In each round, move the black ball on the platforms, skip the obstacles, try not to fall apart, pick up all the diamonds and get to the red stick with the flag.